This sort of work is not what I usually do, at least not on a very regular basis. It is a style I am not always crazy about even though others including some galleristas seem to like it. Just shows you what I know. I started it in Corel Painter one late afternoon when I was pretty much out of gas from working on an oil and was putting off cleaning up. I put down one color after another with some thought of a landscape, nothing more than that. It wasn’t totally random; I wanted a pattern that the eye could follow, but no more planning than that. Anyway, I moved it into PhotoShop, made some small color adjustments and printed the whole thing, using an Epson ink jet printer on some mold-made, heavy and archival ink jet paper. I made two versions, one by mistake with the printer on the wrong (portrait) setting and the other in landscape. The next day or so after that, I started playing around with them, using a black ballpoint pen, ending up with this stylized and idealized urban scene. Of the two, I liked this one the best. And, of course, which one will sell? The other one of course. 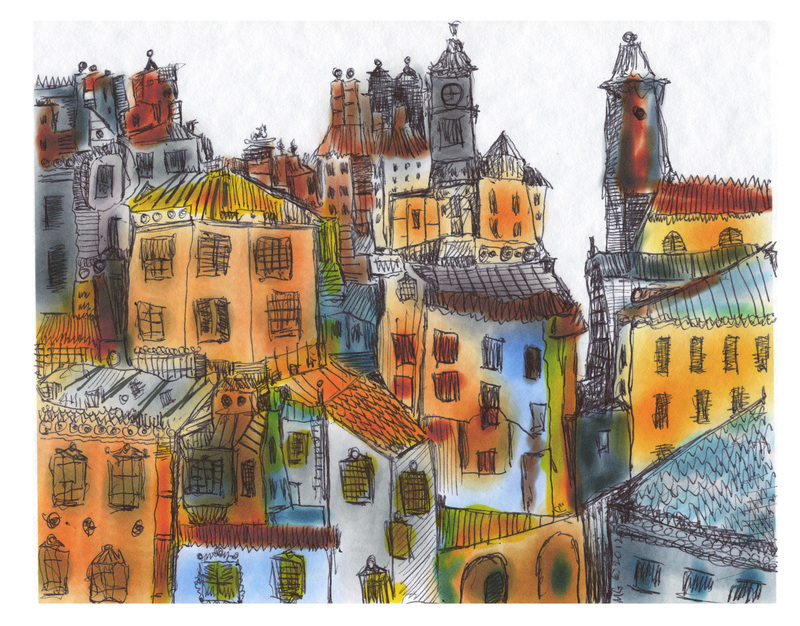 This entry was posted in Uncategorized and tagged ballpoint pen, ink jet, landscape, urban. Bookmark the permalink. Hi, I am an art lover and I saw your work on cariglist. May I see more of it? Would you please contact me at my email?